The safety risks of horizontal curves are generally related to vehicles leaving the roadway and striking fixed objects such as trees, utility poles or rock faces, often resulting in severe or fatal collisions. Guidelines on the Use and Installation of Chevron Alignment Signs is intended to provide engineers and practitioners across Canada with the understanding of the key considerations in the use and installation of chevron alignment signs – a chief traffic control device considered for improving warning and guidance where there is a change in the horizontal alignment of a roadway. The provided guidance on the use of chevron alignment signs addresses rural/urban locations, road classification and network elements. The correct/incorrect placement of chevron alignment signs, hierarchy of curve delineation devices and temporary conditions are also addressed. 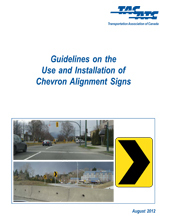 The guidelines are intended to supplement the section documenting the use and installation of chevron alignment signs in the Manual of Uniform Traffic Control Devices for Canada (MUTCDC).